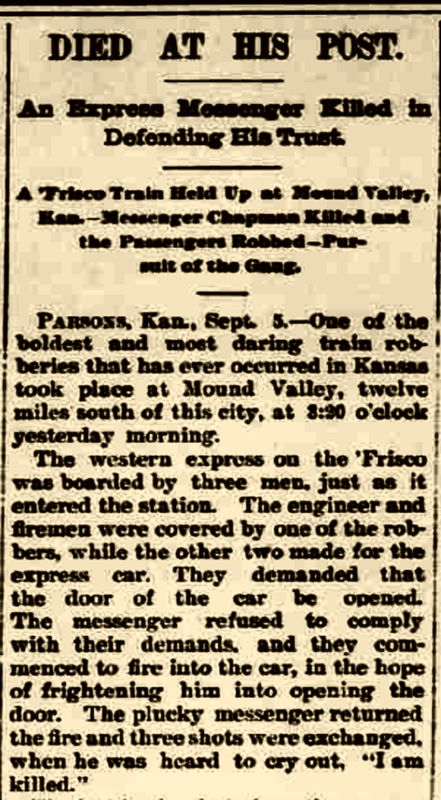 On this date in 1893, three men held up a St. Louis and San Francisco Railway train at Mound Valley, near Parsons, Kansas. Their efforts to rob the safe in the express car were thwarted by the express messenger, Charles Chapman, who paid with his life. After gunning down Chapman, the bandits settled for robbing passengers of about $500 in cash and jewelry, plus a jug of whiskey. Diligent detective work by local lawmen and Wells Fargo detectives quickly identified the three robbers. One of them was a career criminal and self-styled bad man named Will Chadburn, who liked to call himself “Billy the Kid.” Chadburn found himself in custody a month later and, with the prospect of hanging for his crimes, agreed to give evidence against his partners, Hanse/Hans Hydrick and Claude Shephard (Shephard had fired the round that killed Chapman). Chadburn, Hydrick and Shephard were convicted and sent to the state prison at Lansing. Chadburn served just under eight years. Nine months after he was freed, he was back in custody for an Oklahoma post office robbery, which landed him in the federal pen at Leavenworth. Less than two weeks after he walked free in early July of 1905, Chadburn and cohort Ed Madigan robbed a poker game in Winfield, Kansas. 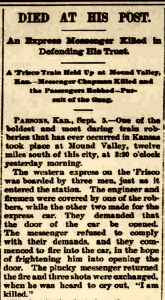 The next day the men were recognized in nearby Cedar Vale by Frank Calhoun, a railroad detective for the Atchison, Topeka and Santa Fe. When Calhoun and the Cedar Vale marshal confronted the robbers, a gunfight ensued and Detective Calhoun was killed. Chadburn and Madigan fled on horseback to neighboring Hewins, where a posse was waiting. In the brief battle that followed, both men were cut down; Madigan was killed instantly, and Chadburn died of his wound two days later. The colorful careers of law dog Calhoun and outlaw Will “Billy the Kid” Chadburn, and their fatal encounter, are detailed in Chapter 9 of Some Gave All. This entry was posted in Uncategorized on September 3, 2014 by J.R. Sanders.